On the day that a Tory Councillor posed in front of tents erected on Cardiff's Queen Street by homeless persons, and demanded that the Council sweep them away, the BBC reports on warnings by charities that street homelessness this side of Offa's Dyke is at 'crisis point'. Chris, from Taffs Well, lived in a people carrier for six and a half years before benefitting from a project called Housing First. It gives people a home and then supports them with whatever problems they have. The typical alternative available to people who are street homeless is to "work their way up" support services, through hostels and supported accommodation. Chris had been a teacher for 25 years, before alcohol dependency led to a downward spiral and eventual imprisonment. After leaving prison he lived in his car, picking up casual work as a roadie. "Casual work in the gig economy means that you can never depend on having a whole week of work so I never seemed to have enough to be able to support a tenancy." He became malnourished and his health suffered, but his life changed dramatically when he was given the keys to his own home through a Salvation Army Housing First project. "Slippers, hot water, a bed - three things you dream of when you're living outdoors... It makes me feel like I'm living in the lap of luxury rather than what most people take for granted." The Welsh Government has already funded six Housing First projects, but Jennie Bibbings, campaigns manager for Shelter Cymru, said more were needed. She called for a wide variety of houses to be built and more empty houses to be brought into use. There are a number of solutions proposed by the various organisations quoted in the piece but Housing First looks like the best long-term approach. What is also clear however, is that many of those sleeping rough have ended up there through no fault of their own. Many are the victims of family break-up, have lost their home due to the downturn and benefit cuts and in many cases have become dependent on drugs and alcohol. A number have mental health problems as well, and have become accustomed to street life. It takes long and patient work to get them settled back into a home, including support and treatment for any issues they may have. The Minister is right that it is not just a case of providing a home for them, and that Housing First is a way forward, but we also need short term provision to be beefed up as well, including more night shelters, day centres where people can get food, a shower, launder their clothes and get medical help, and outreach work. The Welsh Government must urgently review all these services and put more in place. We should not forget either that street homelessness is just the tip of the iceberg. Many homeless persons are sofa surfing, living in inappropriate accommodation or in hostels. It is a much wider problem. 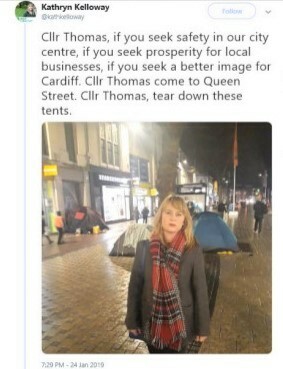 One thing is clear, sweeping homeless people off the street as advocated by this Cardiff Tory Councillor solves nothing other than hiding the problem so as not to inconvenience certain people's sensibilities. Is this Tory councillor pushing 'division' ie us and them showing the harshness of Toryism,shoving problems under the surface rather than tackle the problem. To defend herself she can then say she is just pointing out the problem whilst subtly spreading division? Dic Mortimer has remarked that Government policies have resulted in homelessness at "an unprecedented level that even the Luftwaffe’s bombing campaigns in WW2 didn’t achieve", which is worth repeating if true.